A sports organization known as Asdeporte unexpectedly cancelled a Mexico City 6-k and 12-k run last weekend after a local government official allegedly demanded a $5,000 bribe to allow the race to happen. Before calling off the race, the event organizers published an open letter in social media in which they accused the city official of extortion. “We can’t allow this type of bribery that goes against who we are as Mexicans,” the letter reads. The organizers promised to reimburse all the runners who paid a registration fee. The incident caused an immediate storm on social media, with Mexicans taking to Twitter and Facebook to demand an explanation from the city government and congratulating event organizers for making a stand against corruption. "Typical, now they are playing innocent. I hope heads roll in this corrupt government. Just as they have the "courage" to ask for money, they should show their faces. Congratulations Asdeporte. Those rats are going to put up a dirty fight. Hold on, we're behind you!" The city district in question, known as Benito Juarez, denied any wrongdoing. 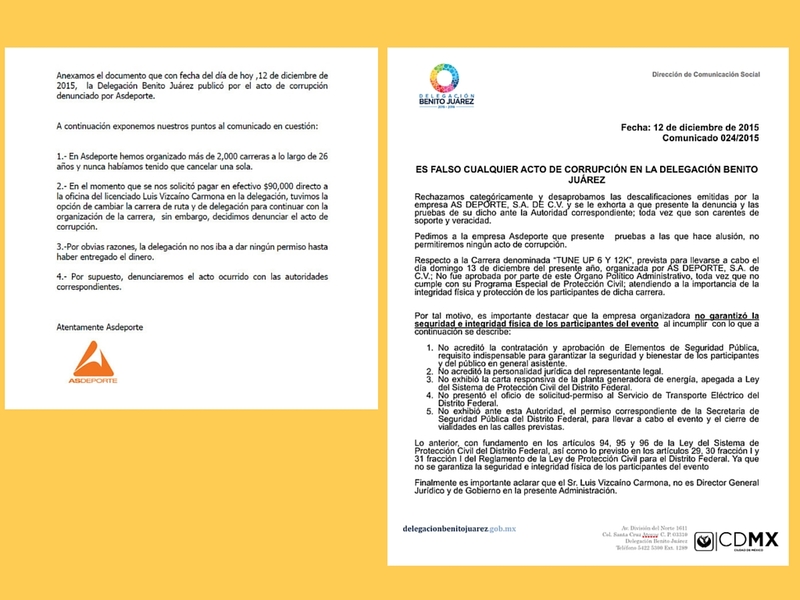 In a press release, district authorities encouraged event organizers to present any evidence of bribery, and said that Asdeporte was denied a permit for failing to comply with basic requirements. During a radio interview, Asdeporte executive Antonio Alvarez said his organization was asked to do what seemed to be an irregular cash drop and was given a deadline — Friday 2pm — to deliver the money or else all race permits would be off the table.